Such programs, when automakers offer employee discounts to the general public, are typically effective in increasing short-term sales and clearing out older inventories. However, they have also been criticized for cutting into profit margins and pulling sales forward from months ahead. 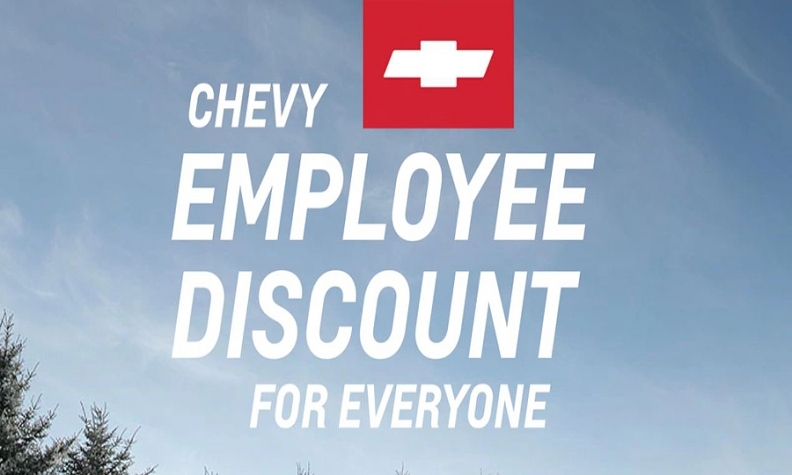 The Chevrolet-exclusive "Employee Discount for Everyone" includes the lease or purchase of all 2018 models and 2019 Equinox, Traverse, Colorado and outgoing Silverado 1500 Limited models. Fleet sales and some base trims are excluded from the deal, which continues through Jan. 2 -- a day before automakers are scheduled to announce sales. The campaign is modeled on an employee sales program from a year ago that was "very successful in driving sales and also strengthening the brand and connecting with customers," said Jim Cain, a GM spokesman. Last year's promotion, he said, led to "a fantastic December and robust January" for the company's sales. Chevy, following an industry sales record in 2016, reported a year-over-year decrease of 2.9 percent in December 2017, followed by a 5 percent increase in January and an 8.8 percent decrease in February. Since 2005, automakers -- primarily domestic -- have used employee pricing to clear out older inventories but also when sales are stalling or the economy is sliding. "It's something you don't necessarily see very often, and it's usually not because sales are awesome and through the roof," said Kelley Blue Book and Autotrader Executive Publisher Karl Brauer. "It's usually when automakers are looking to move some iron and their traditional tactics aren't working as well as they need them to." Using employee pricing on a limited basis isn't necessarily harmful, but Brauer said if such promotions continue for a prolonged period, they can be red flags for the industry. The amount of discount for Chevy's program varies by model and can be added to other offers such as total cash allowance. On its website, Chevrolet is advertising $12,500 off a 2018 Silverado LT All-Star crew cab. That includes an employee discount of $5,000, total cash allowance of $6,750 and $750 option package discount when financed through GM Financial. Many of GM's cars are discounted between nearly $4,000 for a Spark minicar to more than $8,000 for an Impala large sedan. Advertised crossover and SUV discounts range from about $4,400 for a large Traverse crossover to more than $11,100 for full-size Tahoe and Suburban SUVs. Employee pricing is for everyone, regardless of how the vehicle is financed; however, other offers require that customers finance through GM Financial. Autodata Corp. reports that Chevrolet's average incentive spend through November was $4,723 per vehicle, up 5.5 percent compared to the same period a year ago. That compares to the industry brand average of $3,733, up 2.5 percent. Other General Motors brands also are running promotions but not calling them employee pricing. The Automotive News Data Center estimates GM's sales were down 1.4 percent through November, including a 1.3 percent decline for Chevrolet.